Network robustness is a common and fundamental property in many high-impact applications. This project aims to develop basic theories and algorithms to make a robust network by optimizing its underlying topology. The figure on the left presents an illustrative comparison. 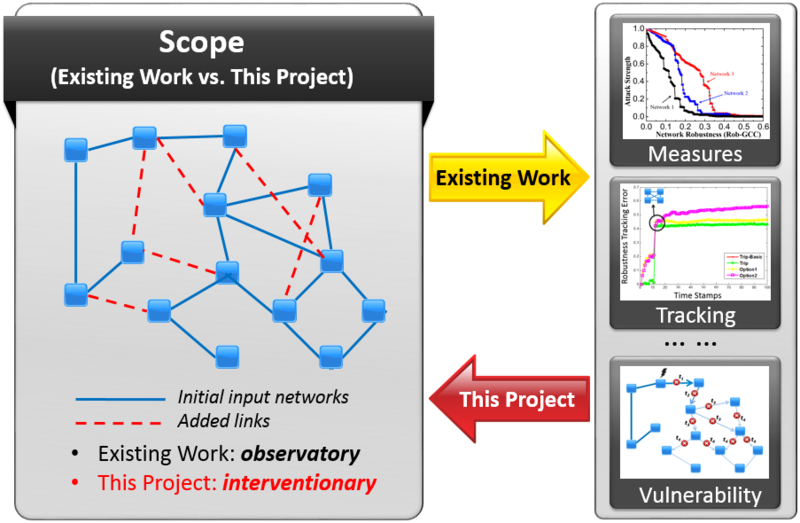 The existing observatory work takes a given network as the input (the blue network on the left) and outputs a specific robustness measure. This project aims to take such robustness measure as the additional input to intervene the current network topology (i.e., adding 6 red dashed lines). Page generated 2018-09-29 09:15:17 MST, by jemdoc+MathJax.